This historic hotel offers you the most convenient downtown location in Kansas City. 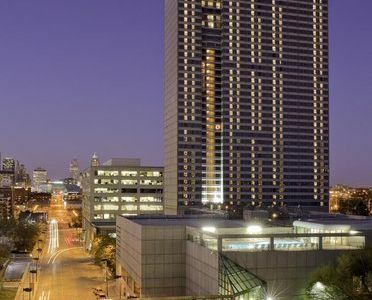 Guest rooms and suites overlooking the Kansas City skyline. Located in the heart of downtown, enjoy Midwestern hospitality and a long list of amenities. Easy access to local sporting events, amusement and water parks, concerts, casinos, fine dining and shopping. Missouri’s largest city is known for its thriving arts scene, eclectic entertainment, some of the country's most exciting live sporting events, and more fountains than any other city in the world except Rome. Check out Kansas City's cultural attractions with trips to the American Jazz Museum, National World War I Museum, and Liberty Memorial. If you're a sports fan, you'll definitely want to join some of pro sport's most passionate fans for a Royals, Sporting Kansas City, or Chiefs game. When the sun goes down, head the Power and Light District for delicious dining, lively nightlife, and a wonderfully unique experience.